1 Is coconut oil a treatment for herpes? Science confirms the healing potential of coconut oil because of its antimicrobial properties. However, no medical studies support using coconut oil as a herpes treatment. In 2001, the medical journal Asian Pacific Journal of Tropical Medicine published a six page review of the medicinal and healing potential of the coconut. Coconut water, coconut oil, and other parts of the coconut were found to have antimicrobial, antiviral, antioxidant, and several other health benefits. Because of the potential of the coconut to prevent and heal disease, several alternative and natural healing websites and forums lay claim that coconut oil heals herpes, or that coconut oil is a herpes treatment. However, there is no clinical proof to support these claims. Is coconut oil a treatment for herpes? Virgin coconut oil is considered a healthy fat. The lauric acid in virgin coconut oil is an medium chain fatty acid (MCFA) which converts to monolaurin in the body. Monolaurin, or glyceryl laurate, is also found in human breast milk. It has anti-microbial properties which help fight against infection. Coconut oil and fat is considered to be the closest to the fat in mother’s milk. Mary G. Enig, Ph.D., mentioned herpes as one of the viruses that monolaurin offers protection against at a symposium in which she spoke in 1996. There appears to be anecdotal evidence to support the suggestion that coconut oil may be a treatment for herpes, but no randomized, double-blind, placebo- controlled medical studies have been done to confirm these claims. Herpes is a virus, known as either herpes simplex virus- 1 (oral herpes) or herpes simplex virus- 2 (genital herpes). Oral herpes, or HSV-1, is experienced by over 80% of children and young adults, according to Johns Hopkins Medicine Health Library. The oral herpes virus is commonly known as fever blisters or cold sores. These sores occur in or around the mouth. They start out as painful red and white blisters which burst, then heal over with yellowish, crusty scabs. Herpes simplex virus- 1 is spread by kissing and sharing personal items like toothbrushes, drinking straws, cigarettes, and sports bottles. Genital herpes, on the other hand, is a sexually-transmitted disease (STD). Currently, one in four sexually active teens and adults have herpes simplex virus- 2, according to the Centers for Disease Control and Prevention. It can only be spread by direct skin-to-skin sexual contact with someone who has the disease. it can be transferred between outbreaks, and often the infected partner is not aware he or she has the disease before transferring it. Genital herpes outbreaks start out as a red skin rash in the genital area. The red bumps burst, form blisters, ooze, and scab over. The first outbreaks are usually the most painful and occur frequently. Over time, the time between outbreaks increases and the associated pain decreases. Once a person is infected with either oral or genital herpes, the virus stays in the body forever. There is no cure for herpes. One of the early researchers on coconut oil was Dr. John Kabara. Dr. Kabara studied the drug-like qualities of various fatty acids, including the lauric acid found in virgin coconut oil. His research showed that the monolaurin found in coconuts does fight “germs,” including viruses. Monolaurin does dissolve the fatty membranes surrounding certain viruses, including the herpes simplex viruses. However, Dr. Kabara stated that in order to be an effective treatment against herpes, 300-900 ml coconut oil would have to be consumed daily. This amount converts to between ten and thirty ounces, or eating up to a full quart of virgin coconut oil every day. Dr. Kabara recommended lauric acid in supplement form rather than eating large amounts of virgin coconut oil. A 2010 clinical study published in Skin Pharmacology and Physiology revealed that applying virgin coconut oil to skin wounds on rats sped up the healing time. After ten days, an increased level of antioxidants was observed, which returned to normal levels in two weeks. Although rat model results do not automatically imply that the same effect would occur in humans, the results to suggest further study. 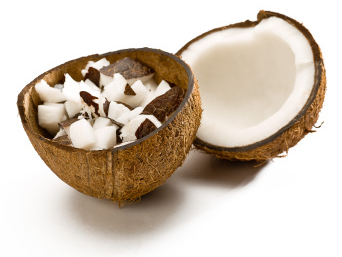 Coconut oil is made from copra, the dried meat (kernel) of the coconut. Most copra is dried by smoking, kiln-drying, or sun-drying in unsanitary conditions. To get the impurities out, most commercial coconut oil must be refined by bleaching and deodorizing it. Sodium hydroxide (lye) is added to prolong the shelf life, and then the coconut oil is either hydrogenated or partially hydrogenated. This type of coconut oil contains trans fats, and should never be used. Virgin coconut oil does not use copra. 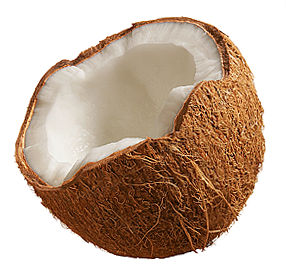 The coconut meat is not refined or heated. The oil is pressed either after quick-drying the coconut meat or while it is still wet, allowing the oil to separate from the water. Unrefined, wet-milled virgin coconut oil is the highest in antioxidants. Pubmed.gov, “Antioxidant capacity and phenolic acids of virgin coconut oil,” by A.M. Marina, et al. International Journal of Food Science and Nutrition. 2009;60 Suppl 2:114-23. Health Impact News Daily.com, “New Research Highlights High Antioxidant Activity of Traditionally Made Coconut Oil"
Hegde, BM (2006). "View Point: Coconut Oil – Ideal Fat next only to Mother's Milk (Scanning Coconut's Horoscope)" JIACM 7: 16–19. Preuss, HG; Echard, B; Enig, M; Brook, I; Elliott, TB (2005). "Minimum inhibitory concentrations of herbal essential oils and monolaurin for gram-positive and gram-negative bacteria". Molecular and Cellular Biochemistry 272 (1-2): 29–34. Isaacs, CE (2001). "The antimicrobial function of milk lipids". Advances in Nutritional Research 10: 271–85. Pubmed.gov, “Effect of topical application of virgin coconut oil on skin components and antioxidant status during dermal wound healing in young rats,” by K.G. Nevin and T. Rajamohan. Skin Pharmacology and Physiology. 2010;23(6):290-7.